I’ve been a big fan of Mediterranean octopus recipes for years but last summer I discovered something new. It started in Kurt Micallef’s culinary working space who I met for one of my meet in your kitchen features in Marsaxlokk in the south of Malta. The young and internationally experienced chef used fennel seeds and star-anise for the octopus broth, an addition that was completely new to me. The two spices bring out all the fine aromas of the imposing sea dweller, even more than the obligatory lemon and bay leaf. I learned my lesson and adapted to this new technique since then. A couple weeks later I moved on to another date for my kitchen series and met Karl Chetcuti at the Meridiana Wine Estates. Although wine is his profession, the two of us also share another passion. We spoke for hours about food, recipes and restaurants, apart from wine making obviously. He told me about his favourite spots on the islands and he also gave me a recipe which he often enjoys together with his wife at one of the restaurants at the sea, golden calamari with chorizo with a glass of chilled Isis wine. Just the thought of it makes me want to change the season and go there right now! When I tried Karl’s recipe in my Maltese kitchen (which my partner’s mother Jenny is so kind to share with me!) I used chorizo salami as I didn’t know that he was talking about fresh sausages, I found out later. This misunderstanding didn’t do our Mediterranean lunch any harm, it was fantastic, but since then I wanted to cook it again, Karl’s way. Although it’s been almost six months of waiting, I finally got fresh chorizo sausages. This time, I decided to make another change, I combined them with octopus instead. The meat seemed too strong and overpowering for the fragile calamari, and I was right. It’s an amazing combination, powerful and rich, but we had to cut the sausage thinner than you can see in the pictures. 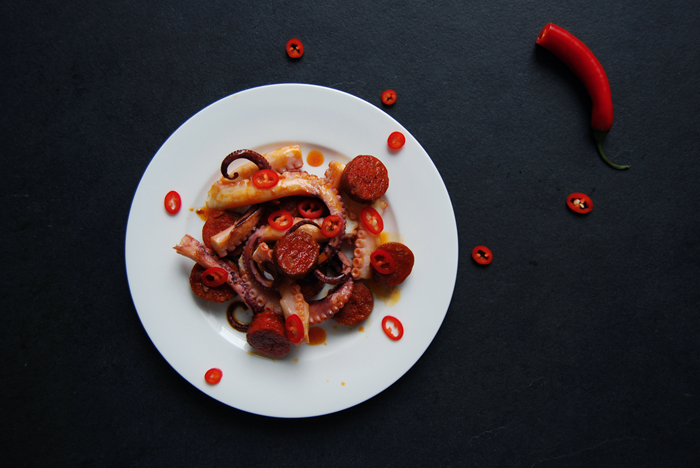 The Spanish chorizo has quite an impact on the seafood but it works, we even sprinkled some spicy chili pepper slices over the red juices. 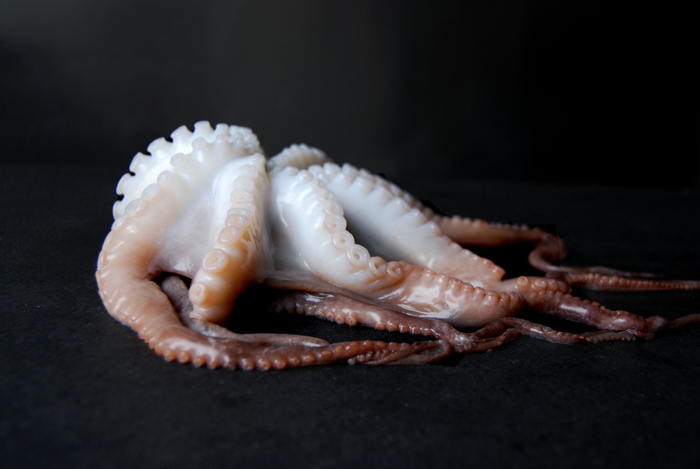 If you’re after the pure buttery taste of octopus I recommend a simple salad with fresh fennel (which we ate the next day as I cooked a bigger batch of it), but if you want to try something new and experiment a bit, go for it and savour as we did! 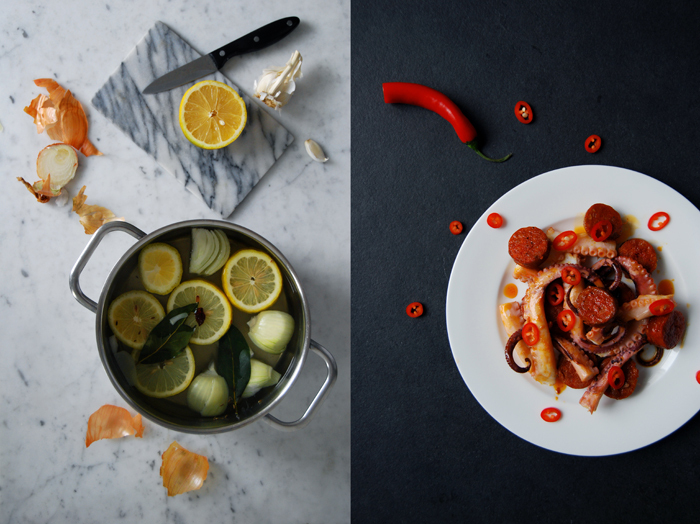 In a large pot, bring water with the star-anise, fennel seeds, bay leaves, garlic, onion and lemon to the boil. Add the octopus and cook on low heat (simmering) for about 45 minutes or until the octopus is tender. Take the octopus out of the broth and cut into big pieces. Fry the sausages in a little olive oil on medium heat for about 10 minutes, turning them every 2 minutes. When they are done, slice them. 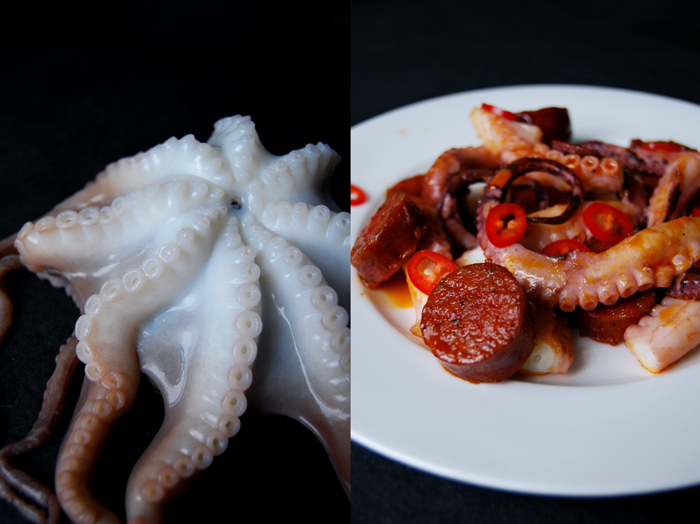 Mix the octopus with the chorizo and the juices in the pan. Sprinkle with chili pepper. 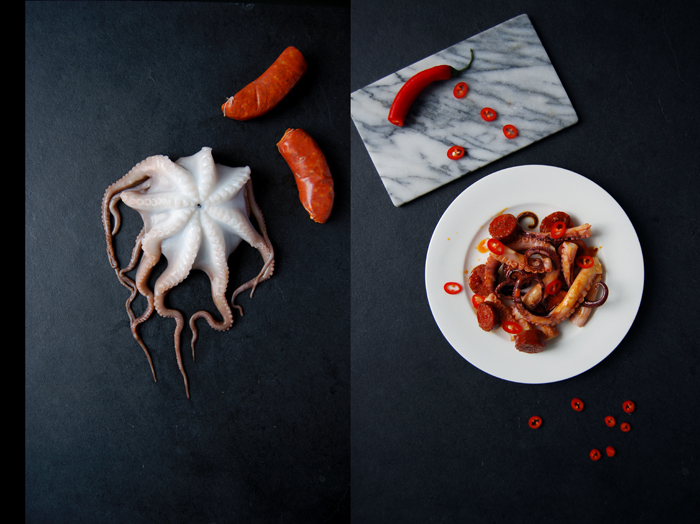 That sounds like an unbelievably delicious combination and your photographs are amazing!